Forgive us, we’re grading on a curve on this one. Truth is, no Baltimore Orioles pitcher surpassed expectations this past season. Forced under gunpoint to pick, we’ll grudgingly give the honor to Guthrie, who notched a season with an ERA under 4.00, thanks to both a sparkling walk rate of 2.15 BB/9 IP and some good luck (.263 batting average on balls in play, vs. league average of around .300). More broadly, Guthrie doesn’t strike out too many batters and his ability to keep the ball on the ground is nothing special. Don’t bid on him next year, except in very deep mixed leagues or AL-only formats. Last December, the Orioles signed Gonzalez to a two-year contract worth $12 million, hoping to finally find a closer after years of searching for one. Almost from the moment that Gonzalez signed the deal, it was a big mistake. In spring training, he couldn’t even muster 90 MPH on the radar gun and spent about half the season in rehab, attempting to recover the ability to dominate batters with strikeouts. He finished the year with just a single save. Certainly, Matusz was also a disappointment this season. Entering 2010, many considered him to be the leading favorite for Rookie of the Year. With just 10 wins and a 4.30 ERA, he didn’t come close. Still, the left-hander has a pretty bright future, as evidenced by a strong close to the season. In 56 innings of work during the final two months, Matusz had an ERA around 2.00 and 43 strikeouts to just 14 walks. 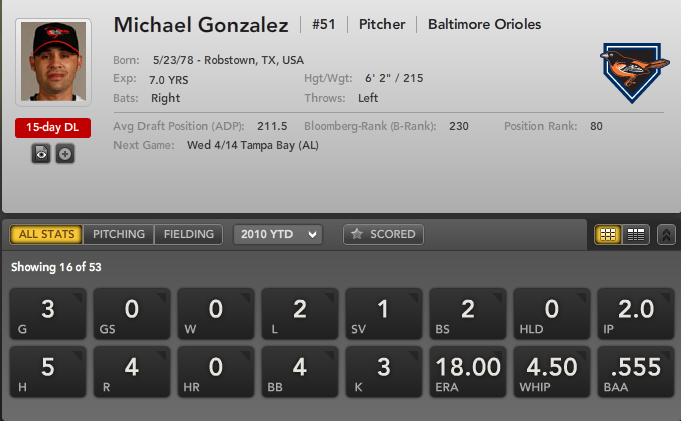 The Orioles’ signing of Mike Gonzalez during the off-season was an odd move. The team had no hopes of competing this year, maybe not even in 2011, yet felt for the talent Gonzalez held, he was too good to pass up for the cost (in draft picks and money). The start of Gonzalez’s 2010 season was not what the team had in mind when the contract was being crafted. Gonzalez made three appearances over the opening week, completing two innings, saving one game, and taking the loss in the other two. On Wednesday, he was placed on the 15-day disabled list with a strained shoulder. There’s little to no point in looking into the statistics of three outings as anything meaningful. One potential trouble sign did emerge, though: Gonzalez’s fastball velocity was down nearly two full miles per hour. Replacing him in the closer role for now will be Jim Johnson. Johnson certainly could morph into a season-long option. Gonzalez’s struggles had certainly raised the possibility of his closer tag being removed. At the same time, it’s hard to see that occurring now with his injury. At best, Johnson will serve as the temporary closer until Gonzalez returns and proves his health. The good news is that the rest of the Orioles’ pen looks like a mess. Well, that’s sort of good news, at least. It means Johnson has little to no competition for those save situations, but it also means a few save opportunities could be blown by lesser quality pitchers. He doesn’t strike out as many batters as you would expect from someone with mid-90s velocity (just 5.0 per nine innings in 2008, an improved 6.3 per 9 IP in 2009), but he is an extreme groundball reliever, which helps to hold his home run totals down. The problem is that the Orioles’ infield defense is rather lackluster, making him a WHIP liability on bad days. That makes young reliever Kam Mickolio a deep sleeper in extremely deep leagues, including AL-only ones. Despite Johnson’s flaws, he’s well worth a pickup in deeper leagues. If nothing else, you can always hoard saves, then trade them for other assets later. In the meantime, keep an eye on Gonzalez’s recovery, and how Mickolio fares in the early going. 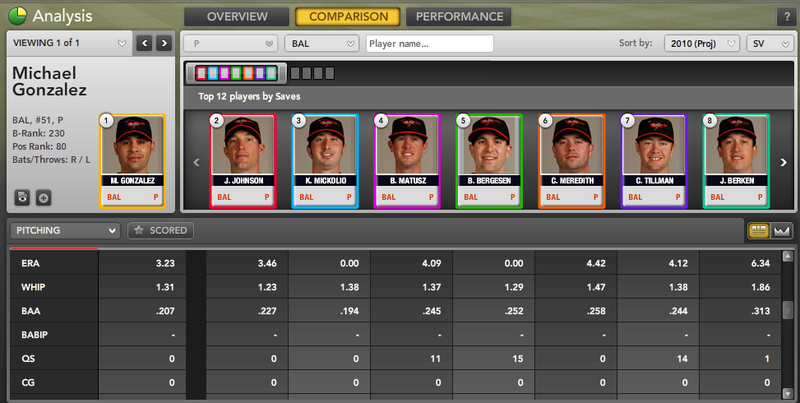 For more on Jim Johnson, Mike Gonzalez, and other closing pitchers, check out Bloomberg Sports’ fantasy kits.